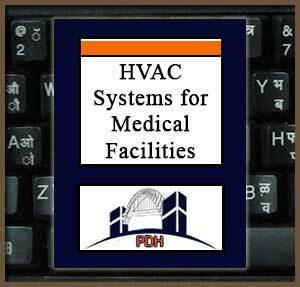 This course will introduce you to heating, ventilating and air conditioning (HVAC) systems for medical facilities such as hospitals and clinics. You will learn about air conditioning requirements, systems, equipment and design practices for the various spaces in health care facilities. You will learn about control systems, air distribution, refrigerants, steam and piping systems. You will learn about special requirements for laboratories and patient treatment and isolation rooms. This course will give the initial understanding you will need to address design issues on complex medical treatment facilities. It will give you a basic introduction to these HVAC systems so you can better understand the technology, concepts and terminology. It will help you to be a better partner in the medical facility design and construction process. This course is intended for all of the engineers, architects and construction professionals on the building design team having an interest in the design and construction of medical treatment facilities such as hospitals, clinics, laboratories and research facilities. Learn about special HVAC requirements for Critical Care Spaces. Learn about Sensitive Spaces and their air conditioning requirements. Learn which spaces in medical facilities are generally not air conditioned. Learn about requirements for mechanical equipment spaces in medical facilities. Learn about the six general areas into which hospital spaces are classified for purposes of HVAC design. Learn about Continuity-of-Service requirements for Critical Care Spaces such as Operating or Delivery Rooms. Learn about the three types of HVAC systems recommended for Outpatient Clinics. Learn the HVAC requirements for Patient Isolation Bedrooms. Learn about special requirements for Research and Vivarium Spaces.